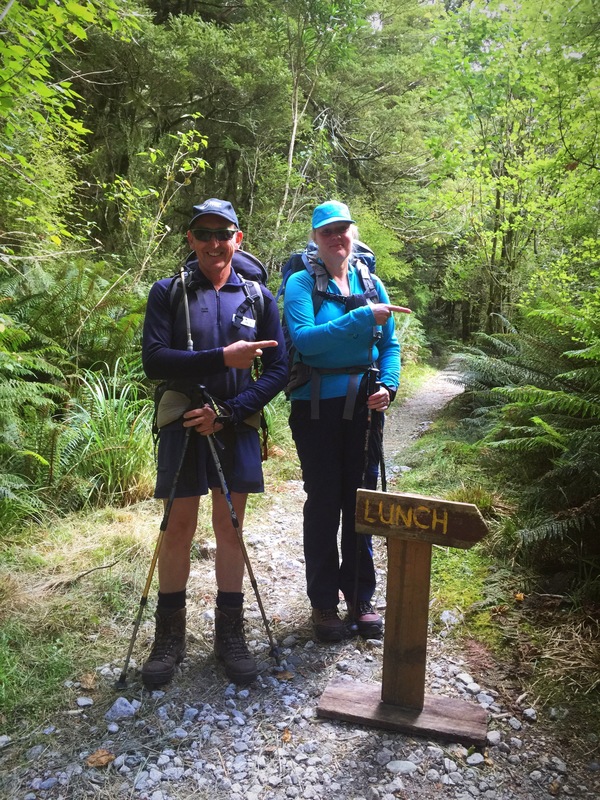 The real walk begins today – 16km to Pompolona Lodge : ). After making our lunches and a delicious breakfast we assembled out the front of Glade House at 8.30am – very civililised. 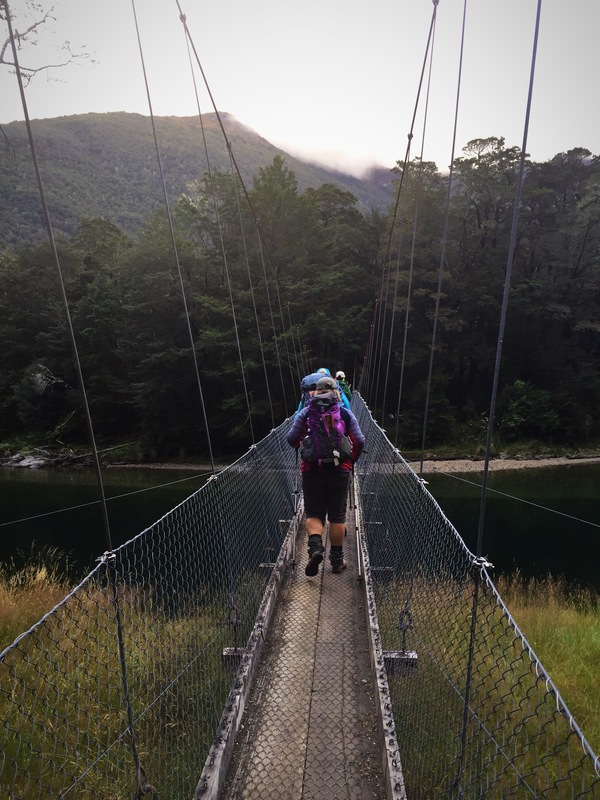 First up we crossed the suspension bridge over the Clinton River and into the Beech forest. Stevie gave us all a laugh with his crossing of the bridge – he looked like he had wet his pants : 0. The markers along the track are in miles in line with the historic measurement used on the track way back when, although they also have the kilometres marked on the side. A mile after crossing the suspension bridge we passed the site of Quinton Mckinnon’s first hut built in 1889. We then took a side path to the wetlands. There were all sorts of plants in here and Mark explained to us what function wetlands play in the world’s ecosystem. 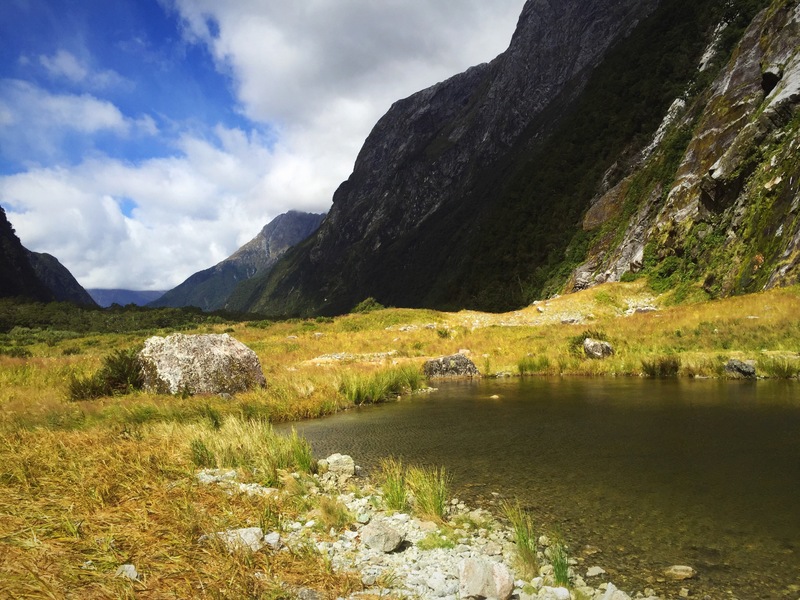 The extent and integrity of New Zealand wetlands has declined. Only an estimated 10% of the historic (pre European) extent of inland palustrine wetlands now remains. 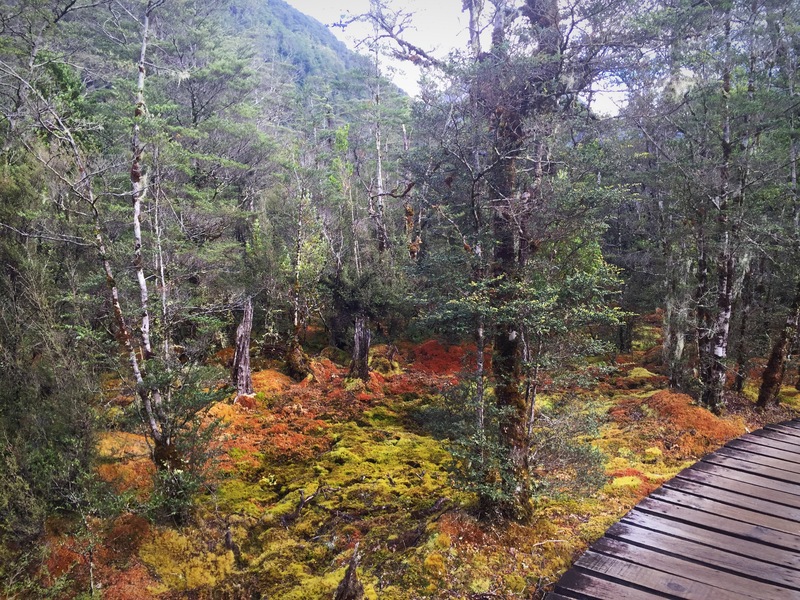 See the link below for a good summary on how Southland’s (including Fiordland National Park) indigenous vegetation has changed. Wetlands help keep river levels normal and filter and purify the surface water. Wetlands accept water during storms and whenever water levels are high. When water levels are low, wetlands slowly release water. Wetlands also release vegetative matter into rivers, which helps feed fish in the rivers. 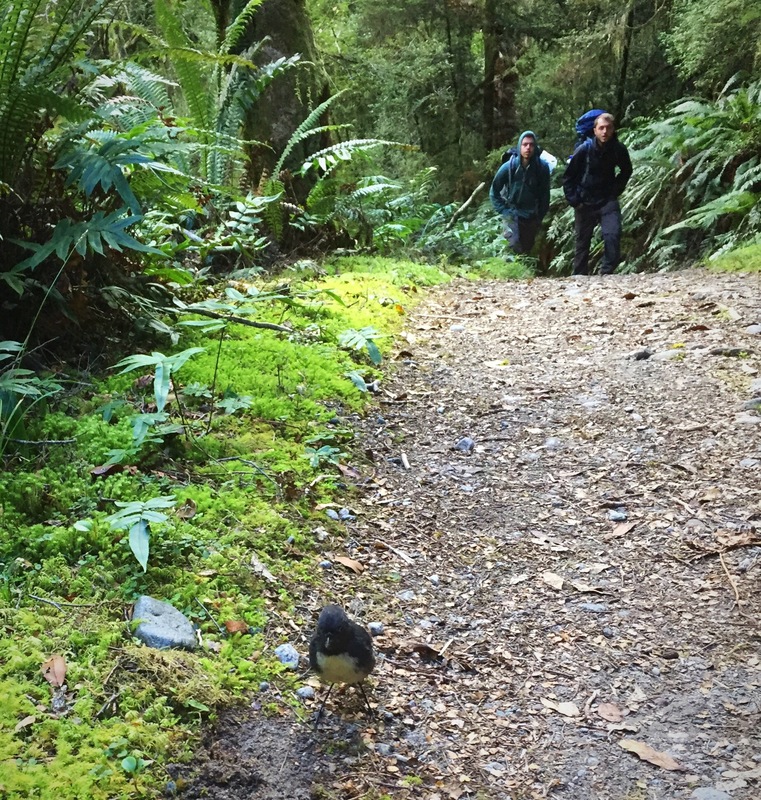 There was a lot of birdlife along the track and we were particularly taken by the South Island Robin – they are a sparrow-sized bird found only in New Zealand, where they have the status of a protected endemic species. They are very friendly and inquisitive birds and came quite close to us. The guides told us to scrape the dirt on the track up and the birds would come to have a look at what we may have unearthed. We also saw a few Tomtis although they weren’t quite so friendly and kept more of a distance. 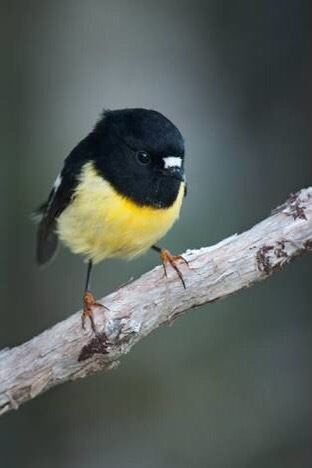 The tomtit is a small passerine bird in the family Petroicidae, the Australian robins. 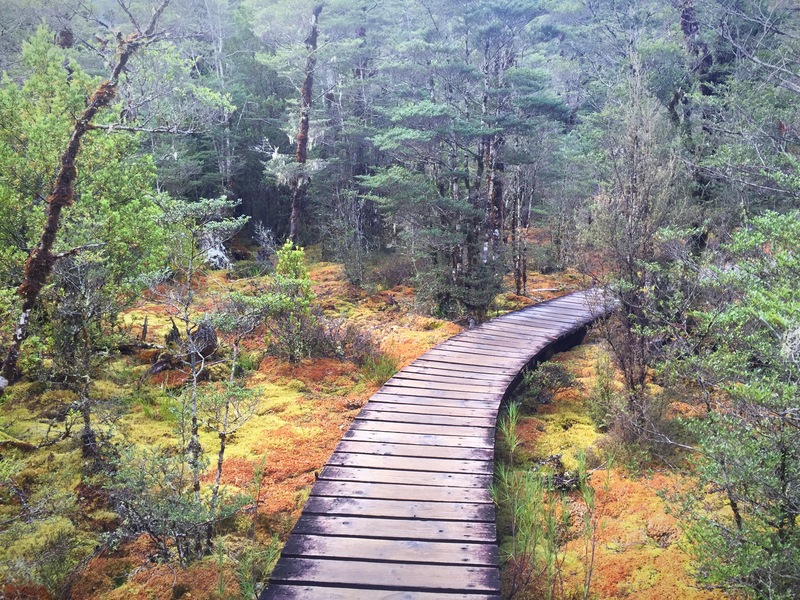 It is endemic to the islands of New Zealand, ranging across the main islands as well as several of the outlying islands. 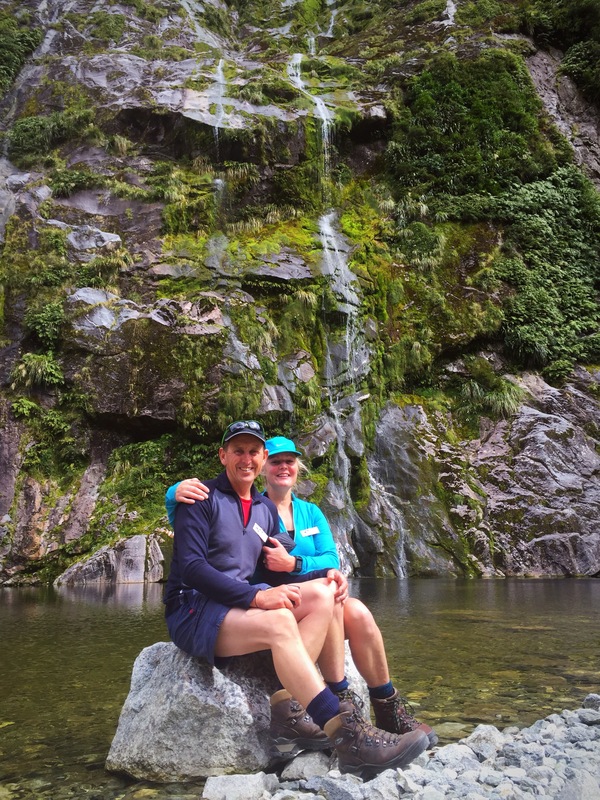 We stopped for lunch at the Hirere Falls Lunch Shelter where the guides made us hot drinks and we ate our packed lunches. 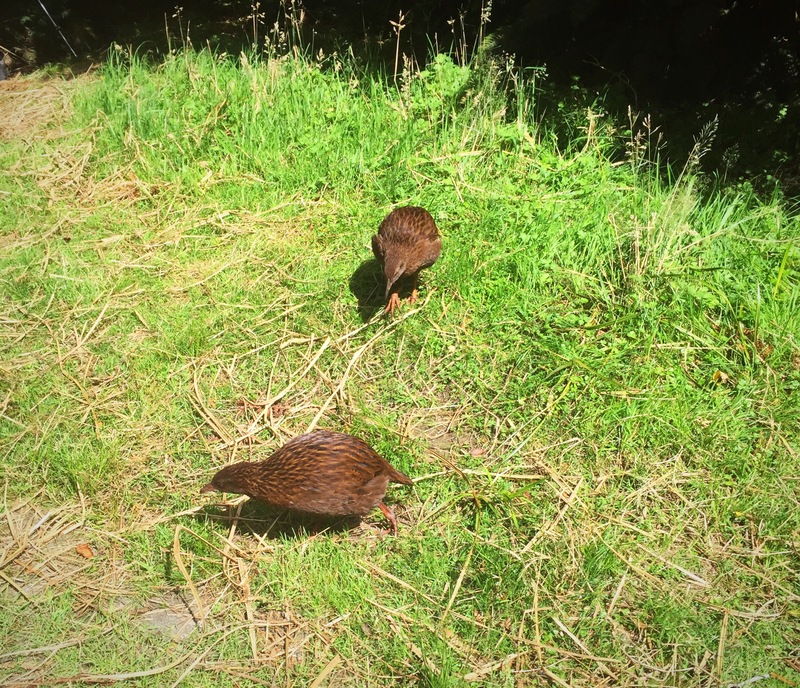 We were joined by a couple of weka. The weka is a flightless bird species of the rail family. It is endemic to New Zealand, where four subspecies are recognized. Weka are sturdy brown birds, about the size of a chicken. As omnivores, they feed mainly on invertebrates and fruit. After lunch we came across a couple of Department of Conservation (DOC) guys who were working on the track. They had been digging some trenches to help clear the water away in heavy rainfall. They pointed out where the waterline can get to – it was well above my head – quite incredible. 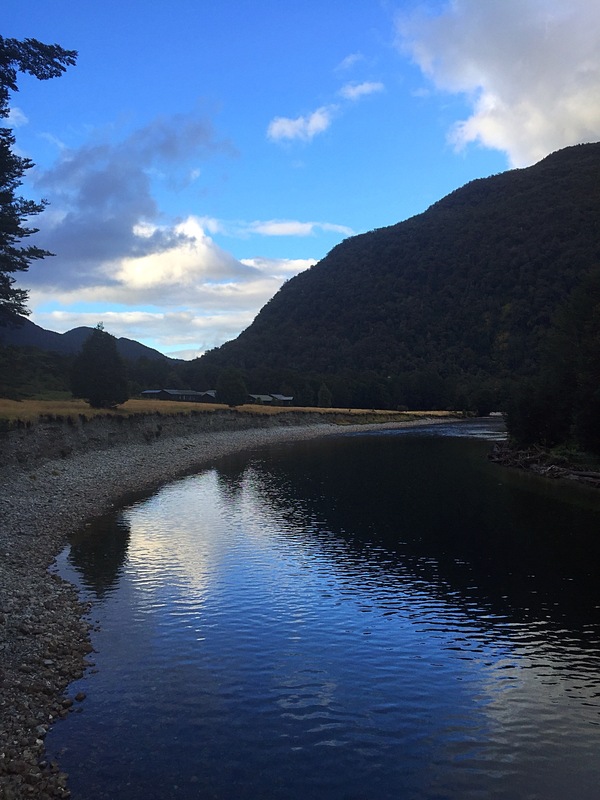 An average of about 7 metres of rain falls per year in Fiordland National Park, over an average of about 200 rain-days per year. The DOC guys said they get helicoptered in and stay in the DOC huts for eight days before being helicoptered out and have six days off. We then got to Prairie Lake where some of the group had a swim. 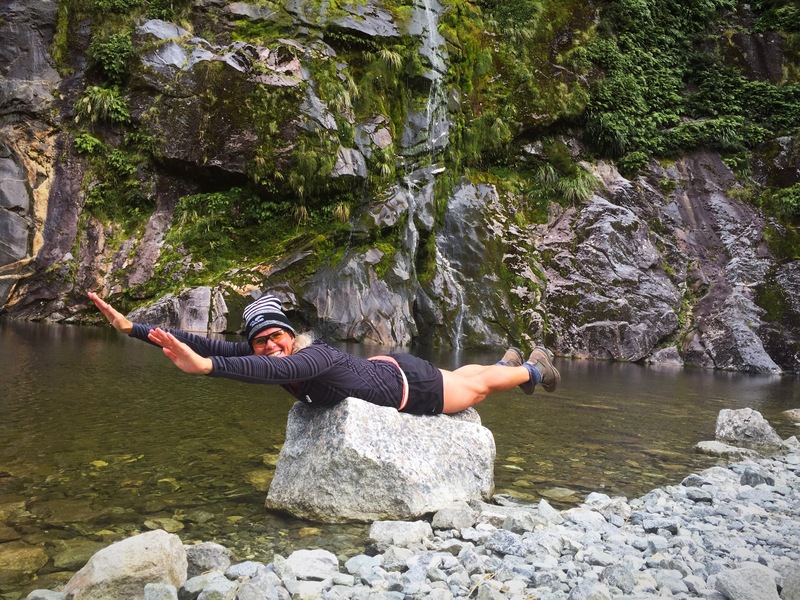 I stuck to my obligatory planking : ). There were a group of freedom walkers there and apparently one was a journalist for the Guardian in the UK. He wanted to take a photo of Phil taking a photo of me planking – I wonder if I’ll become world famous! 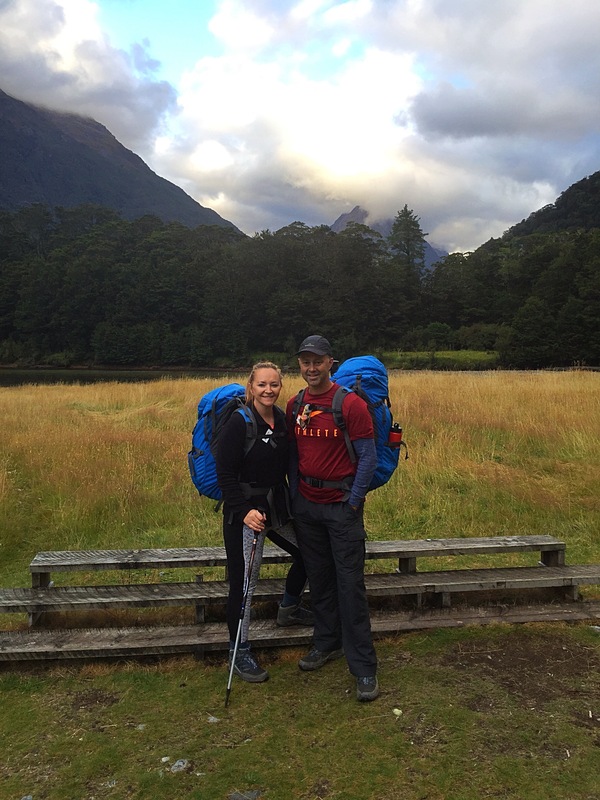 After leaving Prairie Falls we got our first glimpse of the MacKinnon Pass – tomorrows mission. 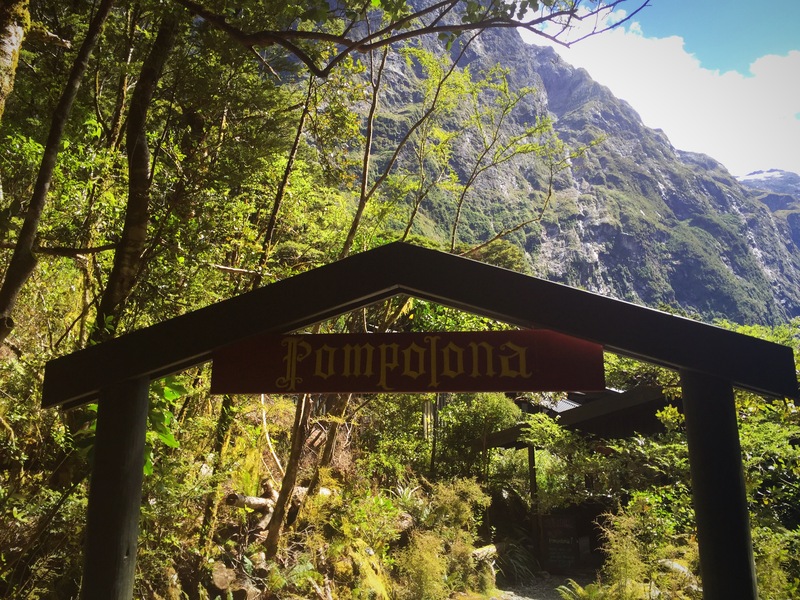 We got into Pompolona Lodge after crossing some quite big rocks. We saw the remnants of a bridge that had been washed away in prior flooding. We can see why they helicopter them out after the season is over – conditions can be pretty harsh in this part of the country. We enjoyed some refreshments in the very sunny lounge at the Lodge and just before dinner the resident keas graced us with their presence. 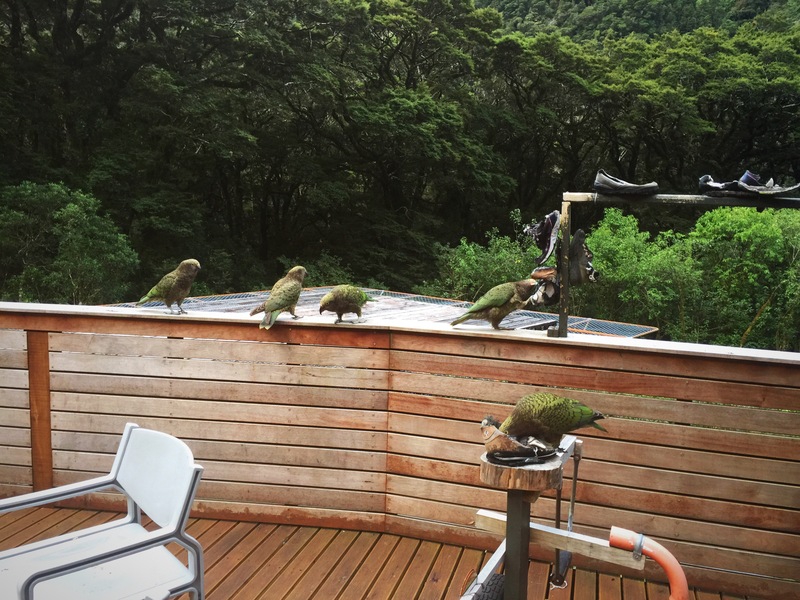 They have attached some old boots to a structure on the deck and the keas take great pleasure in attacking them. 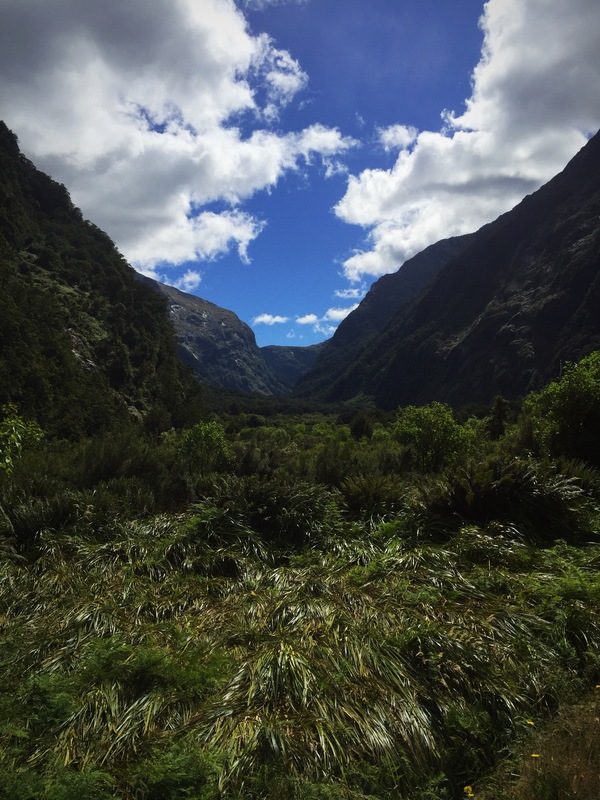 During the last two million years, New Zealand has been caught up in a number of Ice Ages that have affected much of the earth. There were four major cycles of advance and retreat in the South Island during the last 250,000 years. 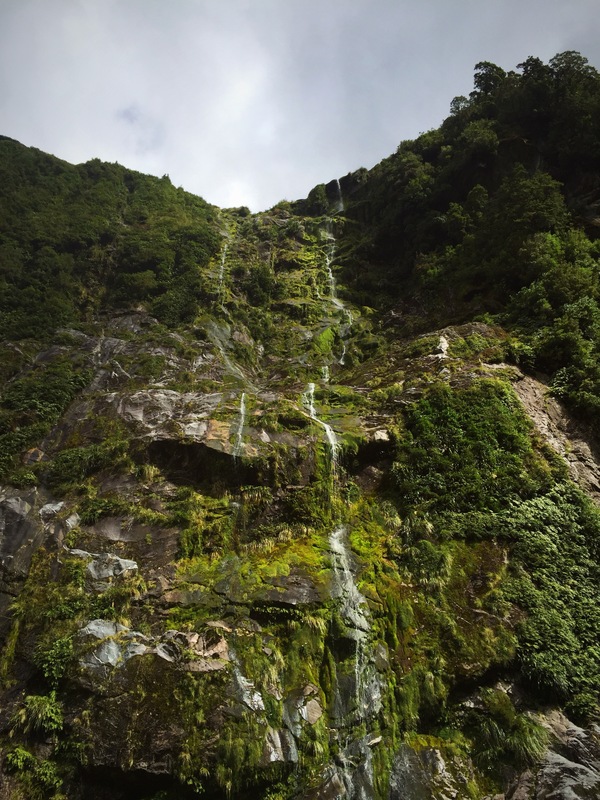 The most recent of these, and the best understood, has been called the Otira Glaciation, which reached its maximum 18,000 years ago. At this time the sea level was as much as 130 metres lower than today because so much water was locked up in the great ice sheets of the Northern Hemisphere. About 14,000 years ago the glaciers began to melt away, or retreat, as temperatures rose rapidly. As the ice thawed, large melt-water lakes often formed in front of glaciers. Eventually the ice retreated to its present-day extent, leaving glaciers that are tiny in comparison to their huge ancestors. Glaciers are rivers of ice, which are fed by snowfall at their head, and flow down valleys until they reach a lower altitude where it is warm enough to melt them. Contrary to popular belief, glaciers do not work like a bulldozer in carving out a valley. As a glacier moves, it picks up rocks. The repeated melt / freeze cycles that occur inside and beneath a glacier pry them from the ground. When a glacier recedes (by melting), it leaves the rocks it was carrying behind. 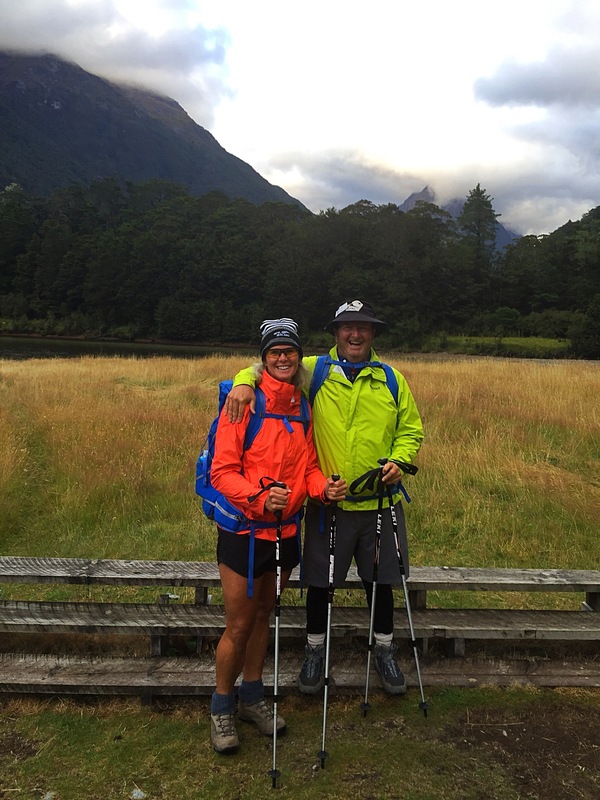 Glaciers have shaped Fiordland. This is evident from the U-shape valleys – meaning they have steep walls and broad, flat floors. In contrast, valleys carved by rivers are described as V-shaped. 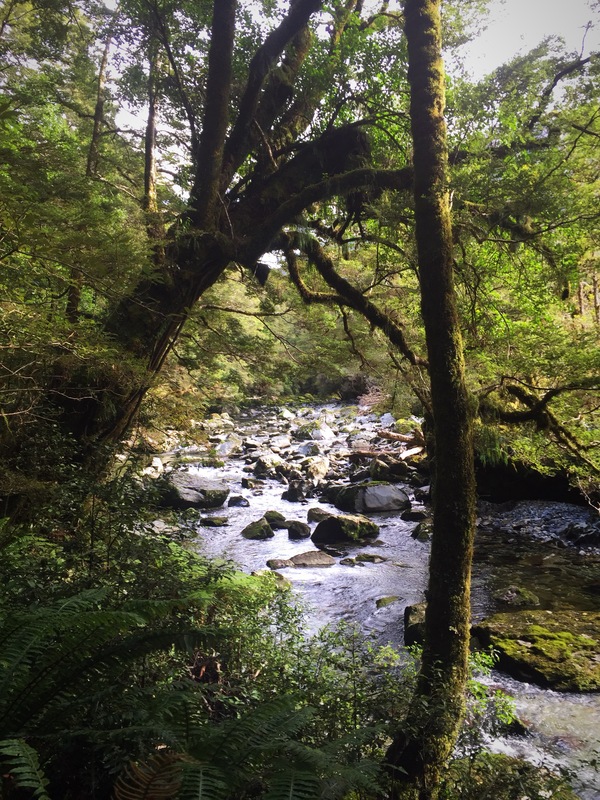 Much of Fiordland is made up of very old hard metamorphic rocks hardened by pressure and heat beneath the earths crust, then uplifted. Thus, the steep valley walls cut by the glaciers have been slow to erode and so remain near vertical, giving the place its stunning topography. Named by Maori for the sound of its call, the kea (Nestor notabilis) is endemic to the Southern Alps of New Zealand and is the world’s only mountain parrot. These sociable and highly intelligent birds are well adapted to the harsh environment. Unfortunately, the traits that kea developed for survival, their curiousity and omnivorous appetite, have created conflict with humans over the last 150 years. Persecution and predation have sorely depleted numbers and, with only a few thousand birds remaining, the kea is a Nationally Endangered species. 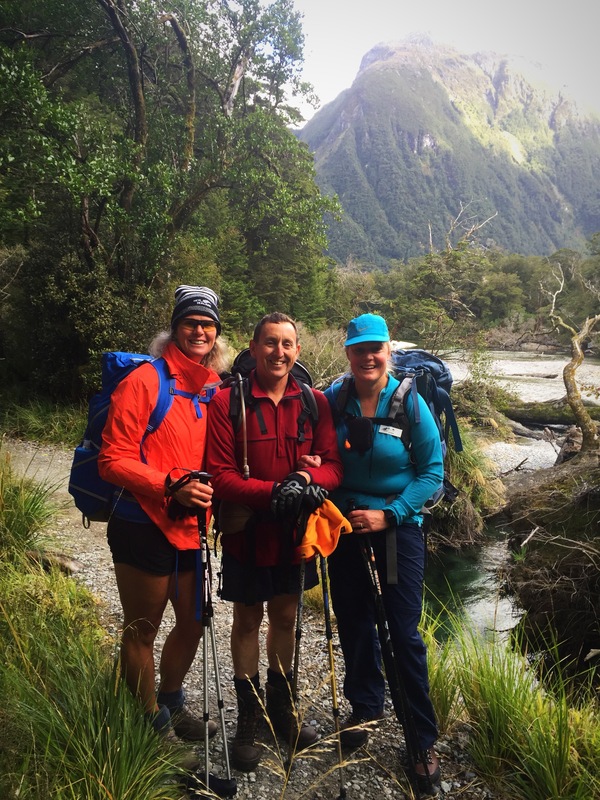 Their environment is extreme and you will often see them in alpine areas such as MacKinnon Pass and the surrounding mountains. Strong flyers, you may see them catching the mountain thermals and flying across the tops of snow covered peaks over 2,000 metres high. Kea are opportunistic omnivores and consume a variety of foods in the wild. Studies have shown that kea eat over 200 different varieties of natural foods including a wide range of animal and vegetable matter. They have also been known to on occasion attack the fatty area around the kidneys of live sheep left high in teh apline areas during winter when resources are low. It is this behaviours of the kea which has made the bird so controversial and led to the slaughter of as many as 150,000 birds over the past 130 years. Kea are one of the few species which have managed to take advantage of humans moving into their habitat. They use their beak, cognitive abilities and tenacity to access resources and investigate any potential uses of objects. Kea nest on the ground in naturally formed cavities. Breeding occurs as early as July through until January. The female cares for the eggs and nestlings in the cavity, whilst the male forages for the whole family. A kea nest takes four months to raise from a clutch of eggs to free-flying fledglings. 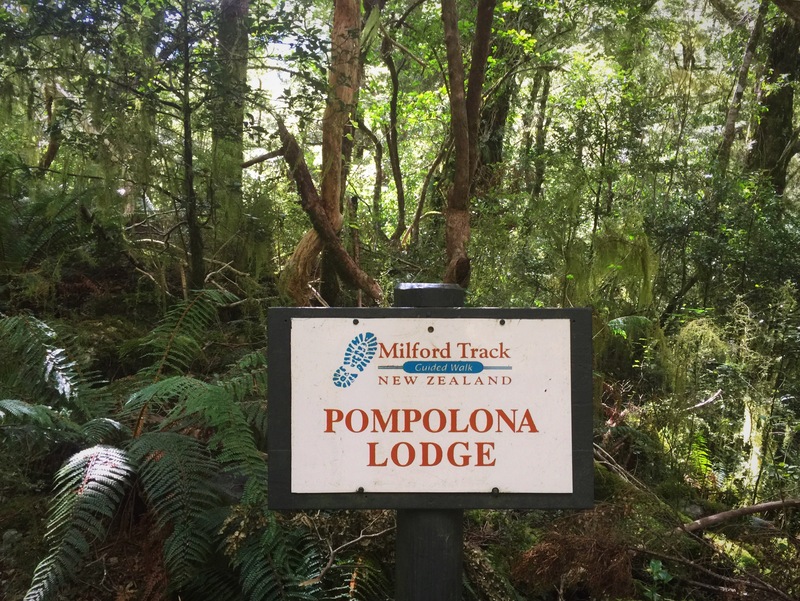 During the rebuild of Pompolona in 1983, the local clan of kea took a keen interest in all this frantic activity after a cold and quiet winter. Just what were these people up to? One bird, for whom building material seemed to hold a particular attraction, began stealing nails. So persistent was the bird’s thievery that an exasperated carpenter chased it (in vain) over the roof of the new main hut. 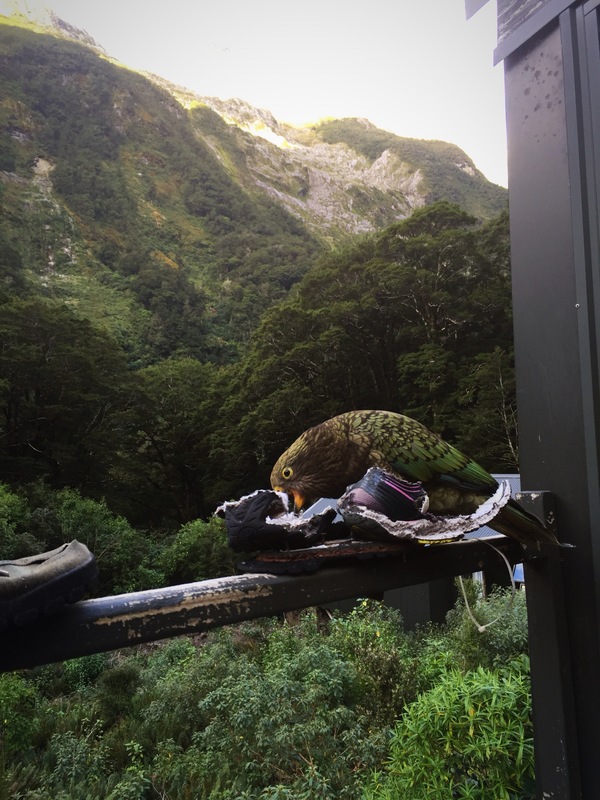 While his back was turned, another kea stole his packet of roll-your-owns, shredding tobacco and papers to the raucous approval of spectator kea perched in nearby trees. Weeks later, after the new hut had been completed, the purloined nails were discovered. They had been neatly laid in the gutters of an outbuilding’s iron roof, sorted according to size. 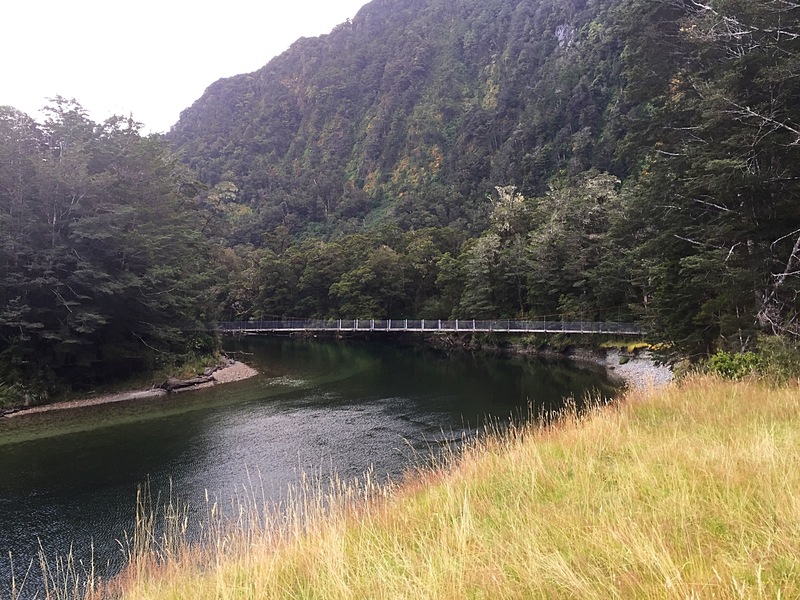 This entry was posted in Fiordland, New Zealand and tagged milfordtrack. Bookmark the permalink.